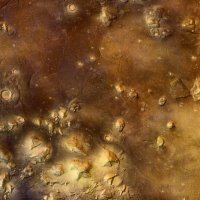 Mars Express has obtained images of the Cydonia region, site of the famous Face on Mars. After multiple attempts from April 2004 until July 2006 to image the Cydonia region at high resolution were frustrated by altitude and atmospheric dust and haze, the High Resolution Stereo Camera (HRSC) on board Mars Express finally obtained, on 22 July, a series of images that show the famous face on Mars in unprecedented detail. Two HRSC perspective views (from the south-west and the north-east) of the massif on Mars that is popularly known as the Face on Mars. The data were gathered during orbit 3253 over the Cydonia region, with a ground resolution of approximately 13.7 metres per pixel. Cydonia lies at approximately 40.75° North and 350.54° East. Cydonia is located in the Arabia Terra region on Mars and lies in the transition zone between the southern highlands and the northern plains of Mars. This transition is characterized by wide, debris-filled valleys and isolated remnant mounds of various shapes and sizes. One of these visible remnant massifs became famous as the Face on Mars in an image taken on 25 July 1976 by the American Viking 1 Orbiter. A few days later, on 31 July 1976, a NASA press release said the formation "resembles a human head." However, NASA scientists had already correctly interpreted the image as an optical illusion caused by the illumination angle of the Sun, the formation's surface morphology and the resulting shadows, giving the impression of eyes, nose and mouth. Nonetheless, the Face on Mars was the subject of widespread speculation on the possible origins and purpose of artificial structures on Mars, with the face being the most talked-about formation. It took until April 1998, and confirmation with additional data from the Mars Orbiter Camera on NASA's Mars Global Surveyor, before popular speculation waned. More data from the same orbiter in 2001 further confirmed the conclusion that the face is a figment of human imagination in a heavily eroded surface. In areas adjacent to Cydonia, gently sloping areas surrounding hills or reliefs, called debris aprons, are frequently found. They form at the foot of remnant mounds and probably consist of a mixture of rocky debris and ice. In Cydonia itself, such aprons are often missing in smaller massifs. The formation of debris aprons is considered to be controlled by talus formation, a sloping mass of rock debris at the base of a cliff, and landslides. At the Face-on-Mars massif, such characteristic landslides and an early form of debris apron formation can be seen. Former larger debris aprons might have been covered by later lava flows in the surrounding area; the western wall of the face moved downslope as a coherent mass. The location of the detachment zone is reflected by a large scarp extending from North to South. The results of large mass wasting, or downslope movement of rock, are also visible at the foot of the pyramid-like formations in the Cydonia region.